本文的标题说明了本文的主题，即论文写作。本文取自名为Dielts Practice Tests Plus的一本书，但未给出原作者和作者的姓名。A段的第一句话表明，目标受众是中学生或在“继续教育课程”中学习的学生。因此可以得出结论，本文的目的最初是提供关于论文写作技巧的信息和指导，但现在它有一个第二目标，即教授阅读技巧。这种风格相当正式，但不像学术文章中那样正式。代词you的使用显示出比学术文献中更低级的形式。这篇文章组织得很好，每一段都涵盖了论文写作过程的一个阶段。The title of this text states the topic of the text, which is essay writing. The text is taken from a book namedIELTS Practice Tests Plus, but the name of the original author and source is not given. The first sentence in Paragraph A shows that the intended audience are secondary school students or those studying in a ‘further education course’. So it can be concluded that the purpose of the text was originally to give information and instruction about essay writing skills, but it now has a secondary aim of teaching reading skills. The style is reasonably formal, but not highly formal as in an academic article. The use of the pronoun youshows a lower level of formality than in academic texts. 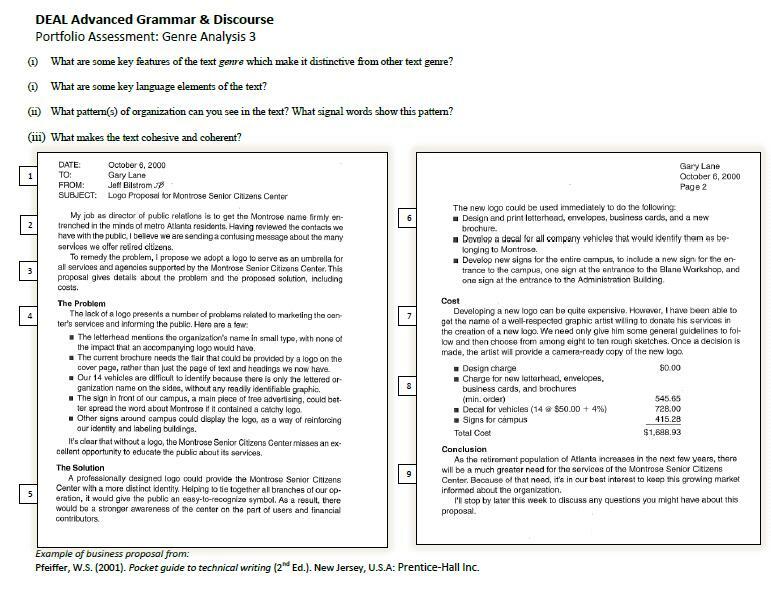 The textis well organised and each of the seven paragraphs covers a stage of the essay writing process. This aim of the text is to inform and instruct, anditfrequently uses the personal pronouns you and your (27 times). There is regular use of imperatives (egpara D – ‘Use a variety of relevant texts, refer to your lecture notes and heed any advice …. ), andmodals, especially should (used six times). Other modals used are will (five times), may and can. Modalsarecommonly usedin texts to give advice. Verbs are mainly in the active voice, although there are some examples of passive (eg paragraph A: ‘Essays ..are designed …; and paragraph C: ‘A list ..is provided ..’). Passives tend to be used in more formal writing. The main tense is Present Simple, which is used for facts which are always or generally true (eg paragraph G: ‘It is important to keep the essay relevant ..’). The only other verb tense is the Present Perfect (used in paragraph A; ‘..youhave researched ..’ and paragraph E ‘Once youhave collected …). Here the Present Perfect is used to describe actionsin which the results are stillnoticeable’. One other notable language feature is use of the first conditional (paragraph B and paragraph C). What pattern(s) of organization can you see in the text (eg listing, sequence, comparison/contrast, cause/effect, problem/solution, extended definition)? What signal words can you find? The main pattern of organization is sequence. According to Mikulecky and Jeffries (2007), the sequence pattern is used when the main idea of the text is a “series of events or steps in a process that follow each other in time order”. Time markers are the most common signal word in this pattern. This text describes the process of writing an essay, particularly from paragraph C to G. The main time marker is then (used five times). Other time markers are When (paragraph D) and Once (paragraph E). Paragraph A gives a definition of essays, and describes two types. There are no clear signal words, although on the other hand is used to show contrast between creative essays and analytical essays. What makes the text cohesive and coherent?